Travellers often get confused when hearing about the Camino Lebaniego and think it ends in Santiago de Compostela like almost all of the other Caminos in Spain. This one doesn’t. But it is easy to see where the confusion comes from. Is the Camino Lebaniego part of the Camino de Santiago? Yes and no. We’ve written about the many different Caminos in Spain here (when we wrote about Camino-themed driving routes) and we’ve separately outlined how you can walk, cycle and yes, drive the Camino here. To get back to the question at hand, yes, the Camino Lebaniego does run parallel to the Camino del Norte from San Vicente de la Barquera, but only for two hours. 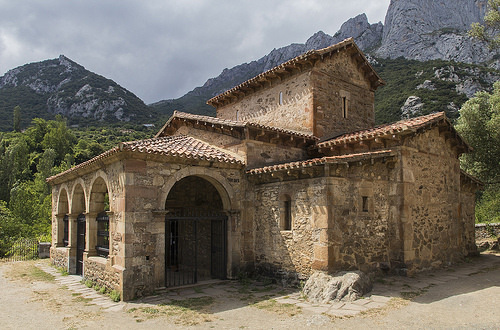 The Camino Lebaniego is essentially a de-tour from the main Camino to visit the largest-surviving piece of Jesus’ cross – the Lignum Crucis – which is kept in a monastery that overlooks the Picos de Europa National Park. Apparently in the Middle Ages no self-respecting pilgrim would contemplate taking on the Camino de Santiago without walking to the Santo Toribio Monastery to see this cross. Walkers would then, as many do now, continue on to Santiago via the Ruta Vadiniense. Why Walk the Camino Lebaniego? We like the idea of starting off with the Lebaniego Way as a family because not only is it on our doorstep but it’s quite an unknown Camino outside of Spain. We’ll be walking the trail over the school holidays, so we will be joined by other pilgrims no doubt but it shouldn’t be as busy as some of the other Caminos. We like it too because it is short! It measures just 72km and is walked over three days. We’re very familiar with many of the locations on this Camino as we’ve driven through and explored here on lots of occasions and have even walked and crossed small sections of it when holidaying in the Picos de Europa. But we’ll still have lots of new scenery to enjoy as the Camino takes in a number of walking trails and tiny country roads we haven’t been exposed to before. So we have the familiarity of the terrain with plenty elements of surprise too! Of course, we won’t be the only ones doing the Camino Lebaniego in 2017 as it’s the “Año Jubileo” which dates back to Pope Julius II’s time in the 16th century. The Jubilar Year is celebrated when the Saint’s Day of Toribio which is April 16th, falls on a Sunday. 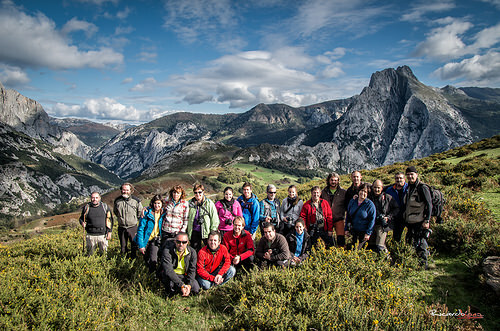 It doesn’t happen often and the next one isn’t until 2023, so the entire Liebana region tends to celebrate in style when it is a Jubilar Year. There’s already quite a build-up locally and you can see the countdown clocks outside the cathedral in Santander reminding us that it’s not so long to wait. Of course, for some, that might be a reason to avoid the Camino Lebaniego in 2017 – but we are always up for a celebration or party and want to experience this first hand for ourselves on the Camino. The Camino Lebaniego is usually walked over three days which is just enough time to relax and unwind and put the brain into neutral – and really get a sense of how special the Spanish Caminos are. Whether you are walking the Camino Lebaniego in the Jubilar Year or not, it’s essential to book accommodation before you set out and Totally Spain can help you with this as well as booking transfers. And if carrying a backpack is a problem for you, we can arrange for a driver to take your bags from one hotel to the next. Should you want a knowledgeable local guide to accompany you each day, we can arrange that too. And how about a really nice place to stay when you’ve finished the Camino and need a bit of pampering? 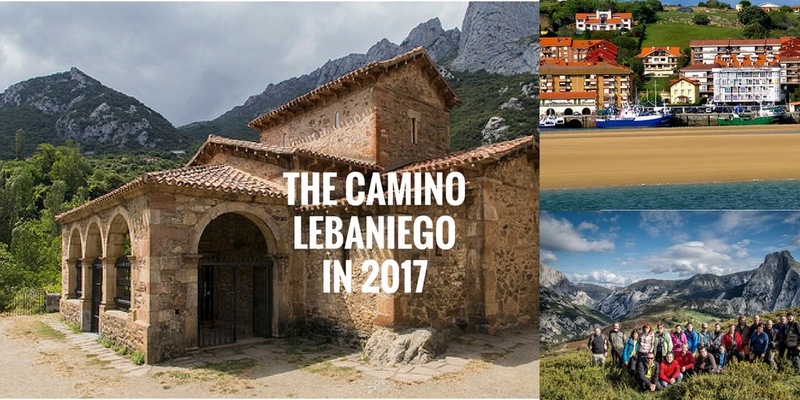 How to Get to the Camino Lebaniego? 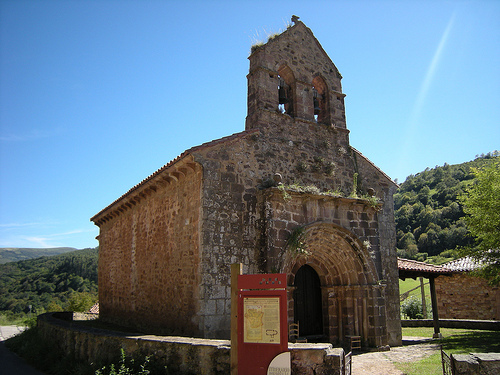 It’s really easy to get to San Vicente de la Barquera where the Camino Lebaniego commences. You can fly direct into Santander’s Seve Ballesteros airport from London, Lisbon, Brussels, Rome, Edinburgh, Dublin, Berlin, Barcelona and Madrid (see Iberia and Ryanair). And Brittany Ferries arrives into the centre of Santander from the English ports of Plymouth and Portsmouth. We can arrange a private driver to pick you up from the port or airport and take you to San Vicente. Remember to collect your credentials in the cathedral in Santander before leaving the city! If Bilbao Port or Airport offers you better connections, we can also arrange a driver to collect you and bring you to the start of the Camino. Of course, if you have lots of time, you could even walk the Camino del Norte from Bilbao or Santander to San Vicente. You’d need 9 days to walk from Bilbao to San Vicente or just 3 days from Santander to San Vicente. 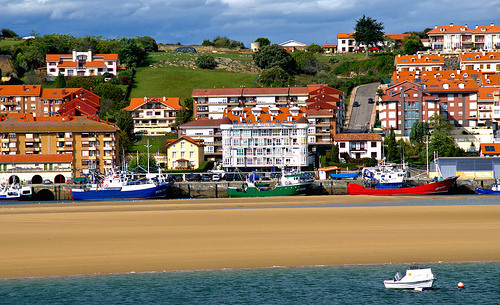 If you don’t want to walk but would like to visit the Camino del Norte landmarks, we can arrange for your private driver to stop off at the picturesque towns of Santillana del Mar and Comillas which are on the Northern route. Below we’ve summarised an overview of the territory (see the original trail info here in Spanish) to give you a sense of what you will come across on the Camino Lebaniego. And you should probably download or print out this map too! The fishing port of San Vicente is a wonderful place to start any walk as it not only has a charming beach and castle but also boasts magnificent views of the Picos de Europa mountains. 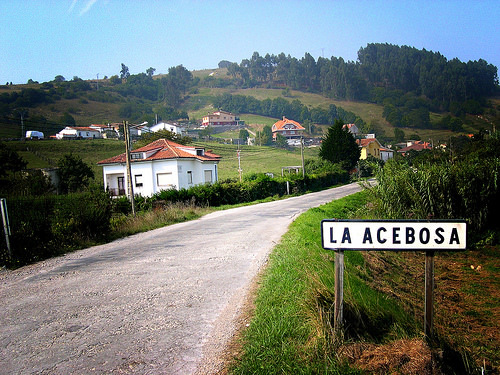 The Camino Lebaniego actually runs parallel to the Northern Camino from San Vicente for about 10 kilometres, passing through a number of hamlets and villages such as La Acebosa and Hortigal until the two paths separate at Muñorrodero. From here, the Lebaniego trail takes you through the lovely valleys surrounding Camijanes and onto Cabanzón. Your day’s walk finishes up at Cades where you’ll find a pilgrim hostel to rest and recover. For Totally Spain clients we’d recommend staying in a charming and fully-restored 19th century Cantabrian Casona in Herrerias (just before you get to Cades) where full bed and board is available as well as a jacuzzi if you book the suite. When in Cades, you should visit the foundry that dates from 1752. The second day is a slightly longer walk. 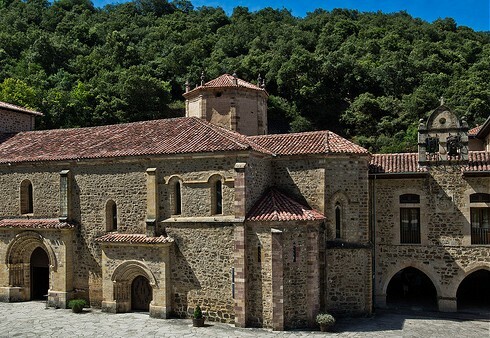 You’ll take in Sobrelapena and La Fuente where you should seek out the charming 12th century Santa Juliana church build in the Romanesque style. You’ll take in views of the stunning Lamasón Valley and descend down into Cicera, a small hamlet where you’ll find a hostel if you need to overnight here. 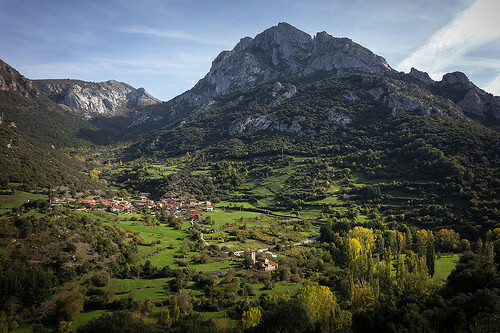 If you are continuing on, you’ll get to enjoy the charming 9.6km wooded walk until you reach Lebeña. 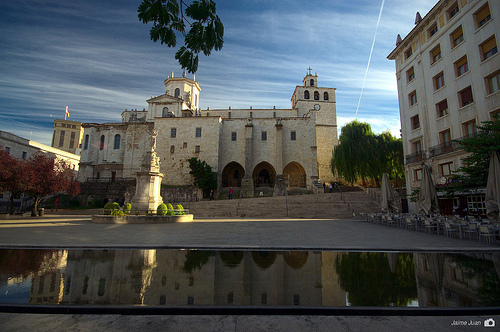 Rest up at the Santa Maria de Lebeña church which dates from 925. Walk on to Allende and if you need to stop, in Cabanes you’ll find a hostel to overnight. For Totally Spain clients , we can arrange a collection point and have you driven to a nearby comfortable hotel or casa rural. Don’t be fooled by the short distance. It’s a very pleasant walk but there is a significant incline to factor in at the end. 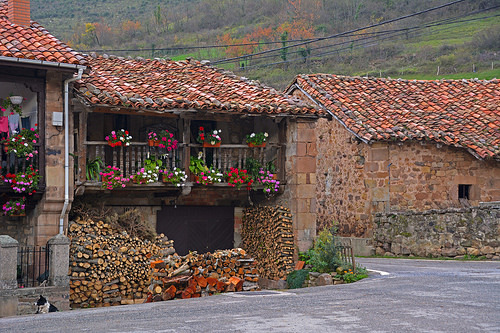 From Cabanes you’ll pass through Pendes which is well-known in Cantabria for its delicious cheeses and more recently because a re-make of Heidi was filmed there. 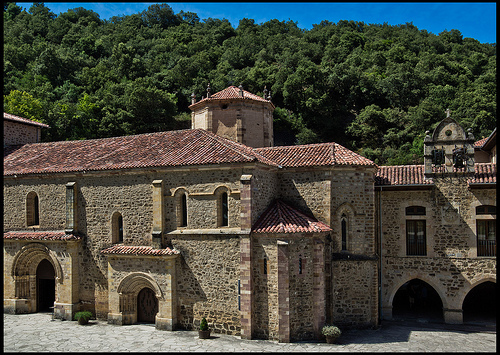 Pass the hermitage of San Francisco de Tresvega and make your way to Tama. 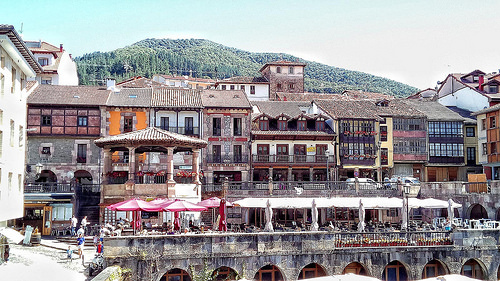 Take the Camino de Campañana to avoid the main road and before you know it, you’re in Potes. From here, you’ll need to gather your strength for the ascent. Make sure to eat and rest a bit. As you leave the town, you’ll see the Torre del Infantado – which you will probably not want to visit now but make a mental note to visit it on your way back down. Take the road to up to the monastery of Santo Toribio which is just 4.2km but involves a steep incline. As you climb you’ll see the monastery which dates from the 13th and 18th centuries. 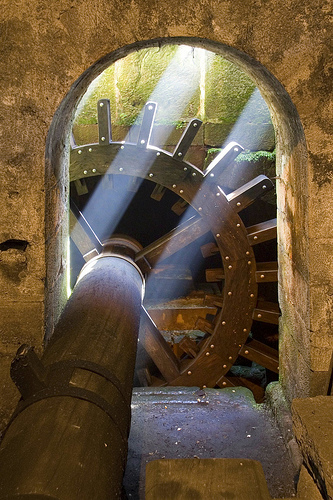 This is where you’ll find the largest surviving piece of Lignum Crucis which is believed to be the cross upon which Jesus Christ was crucified. We’ll also be looking to see the Puerta del Perdon which can be translates at the Door of Pardon – and we’ll probably have a bit of apologising to do – after the pain of the blisters settles down and the euphoria of completing the Way sets in. Although many of our fellow walkers will be continuing on the Ruta Vadiniense to hook up with the French Camino, we’ll be more than happy to call it a day from here. There is a hostel at the monastery but for Totally Spain clients we recommend the delightful Hotel del Oso in nearby Cosgaya – which is a firm favourite among our clients. We also love to stay here as you can see here. After a night or two of pampering, we’re sure we’ll be ready to return to the real world with hopefully some new perspective on life to bring home, to school and to the office. What To Do After the Camino Lebaniego? After you’ve had a day to rest up, you’ll want to explore a little more of beautiful Cantabria and a self-drive tour will be perfect for you to do just that! We always recommend seeing Cantabria’s amazing caves, the museums, and you might even fancy taking on some surfing or at least enjoying watching the surfers on the huge sandy beaches. Cantabria offers so much for foodies and you can find out what to sample here in our Cantabrian gastronomy guide. We will also be giving you a list of the best food markets, farmers markets, tapas bars and restaurants. If you are travelling in 2017, we recommend checking out the new Botin Centre in Santander and the new cable car at Cabarceno Natural Park. If you’d like to get a sense of the rest of Northern Spain– have a look at our detailed guide on what else to see & do. Posted in Active breaks, Camino de Santiago, Cantabria, Family Breaks, Green Spain, National Parks, Popular Posts and tagged 2017, Camino, Cantabria, hiking, Jubilar Year, Jubileo, Lignum Crucis, National Park, northern spain, Picos de Europa, Potes, San Vicente de la Barquera, Santander, Santiago, Santo Toribio, The Way, trekking, walking.